Hopefully, all of you had an enjoyable Summer and are now back to your various pursuits in academia, industry, full-time research, or other aspects of your regular daily lives. By all accounts, the ISER XXI Biennial Meeting in San Francisco (July, 2014) was a resounding success. From my own perspective, the plenary lectures, platform sessions, and poster presentations were superb and well-attended. Over 750 registered attendees, representing at least 35 countries, were present; nearly 25% of them were Young Investigator or Student ISER members. There were 78 platform sessions (with 427 oral presentations total), most of which included at least one Young Investigator speaker, plus three poster sessions (with 174 poster presentations). We also were able to award 33 Travel Awards to facilitate the attendance of Young Investigators. In addition to the presentation of the Endre A. Balazs Prize (Dr. Patricia A. D’Amore), the Ernst H. Bárány Prize (Dr. Thomas C. Yorio), the Ludwig von Sallmann Prize (Dr. Christine A. Curcio), and the Retina Research Foundation’s Paul Kayser International Award in Retina Research (Dr. Robert E. Marc), Special Recognition Awards were presented to Drs. David S. Williams and Suraj P. Bhat (UCLA)-- the Scientific Program Organizers for the Biennial Meeting-- as well as to Dr. John S. Penn (Vanderbilt University), ISER’s Meeting Liaison, and Dr. Thomas Freddo (University of Waterloo), a former ISER Councilor, Treasurer, and President and longtime active ISER member. Congratulations to all the awardees! Earlier this past Spring, ISER solicited the membership for volunteers to serve on the various committees that participate in ISER’s governance structure and help shape ISER’s activities. The response to this solicitation was so large, we actually had to turn away many volunteers. 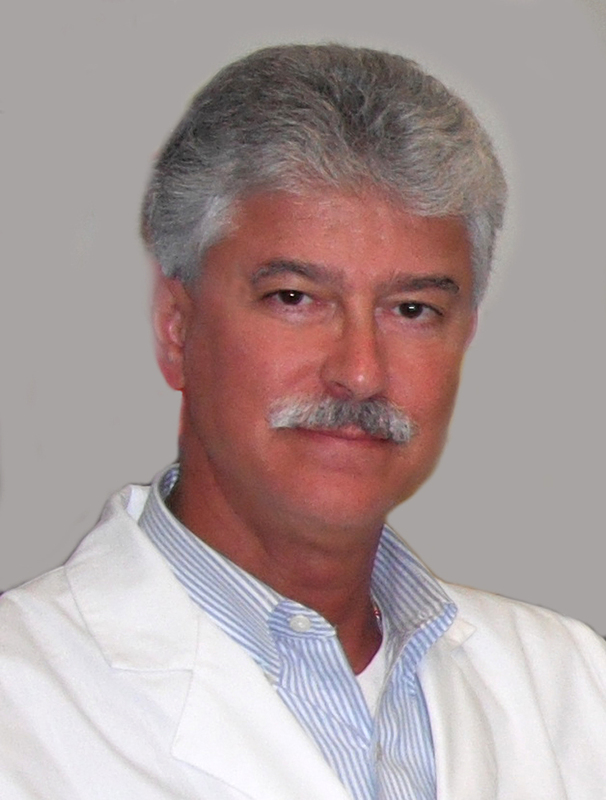 I’d like to thank all those who volunteered for service, and now welcome the following new committee members: Membership Committee (Dr. David Hyde, Chair)- Drs. Renu Kowluru and Marc Kantorow; Communications Committee (Dr. Gerard Lutty, Chair)- Drs. Luminita Paraoan, Bryan Jones, Goldis Malek, Megan Capozzi, Chan-Jung Chiu, Juana Gallar and Xi-Qin Ding; Fundraising Committee (Dr. Ernst Tamm, Chair)- Drs. Oscar Candia, Justine Smith, Norman Kleiman, Stephen Moss, and Olaf Strauss; Mentoring Committee (Drs. Tailoi Chan-Ling and Patricia A. D’Amore, co-Chairs)- Martine Jager, James Handa, Kate Keller, Sandra Suarez, Darlene Dartt, Suzi Fleiszig, and Mini Aga. Looking forward, plans are underway to hold a second “off-year” ISER meeting, in 2015, topically focused on mechanisms and treatments for glaucoma, in follow up to the widely successful 2013 Sarasota Symposium on Molecular Mechanisms in Glaucoma. Stay tuned for further announcements regarding this upcoming conference. Meanwhile, the date and location have been set for the ISER XXII Biennial Meeting, which will take place in Tokyo, Japan, September 26-30, 2016. This would be the fourth time ISER has held a Congress/Biennial Meeting in Japan [prior such meetings were held in Osaka (1978), Nagoya (1986), and Yokohama (1996)], and the third time an ISER Biennial Meeting has been held in the Asia-Pacific region in the 21st century. Solicitations for topical sessions for the Scientific Program will be forthcoming some time in 2015; watch for the announcements. In September, 2014, the call went out for nominations for candidates to fill the offices of ISER President-Elect, Young Investigator Councilor, and Vice-President/Asia-Pacific. As of this writing, the elections were to be held in late Fall of 2014, with announcement of the winners to be made by December, 2014. The new officers will assume their respective positions as of January 1, 2015. Guidelines regarding the election process can be found in the ISER Bylaws. As my term as current ISER President draws to a close (Dec. 31, 2014), I’d like to thank the members of the ISER Executive Committee (Drs. Chris McGahan, Tailoi Chan-Ling, and John Penn), the other ISER Officers and various Committee members (particularly the present and former Committee Chairs), as well as the AMS office staff, who greatly assisted me during my tenure as President. A special note of thanks goes to Dr. Thom Freddo, who served as Immediate Past President during the first year of my term in office, and offered guidance, encouragement, and many helpful suggestions along the way. Finally, I thank all of you -- the ISER membership -- for your continued commitment to participation in the ongoing and future activities of ISER. I invite you to consider further participation in the governance structure of ISER as opportunities arise, to ensure the continuance of all that ISER does to fulfill its motto: Making a world of difference in eye research. The first biennial WISER event was held on Wednesday, July 23rd at Osha Thai restaurant adjacent to the ISER meeting site at the Hyatt Regency Embarcadero. A collection of 21 junior and senior women ISER members attended. After a delicious meal, the group moved to a private area in the Hyatt atrium. In this intimate setting, the group shared personal experiences and challenges faced by women in biomedical research. The group also discussed what each person wished to gain from attending future WISER events. The majority of women expressed that they wanted WISER to provide an environment where they can learn from other successful women scientists, providing a strong support system for the women members of ISER. Thus, future WISER gatherings should strive to be an outlet that allows women to ask questions or seek advice from other successful women scientists in a comfortable and non-intimidating environment. In addition to sharing expectations for what WISER should offer its members, senior scientists also shared valuable experiences with the group. One attendee introduced the strategy of qualified women partnering with peers for reciprocal nominations for awards and leadership positions. Another scientist shared the importance of being assertive, but not aggressive, when taking leadership roles. She also suggested to the younger attendees to make a conscious effort to observe the way successful women in science behave and acquire those traits. These are just a few examples of some of the powerful and supportive conversations that were held during the first biennial WISER meeting. Although no specific plans were made to meet again before the next ISER meeting in Tokyo, several women present showed interest in joining a WISER steering committee to help shape and organize the next major WISER event in 2016. In essence, this initial WISER meeting provided a solid foundation for future WISER meetings. It offered the opportunity for a small group of women in science to share a meal, form new mentor/mentee relationships and in some cases develop new friendships. To build upon the momentum of WISER developed in San Francisco, WISER will organize a gathering at ARVO 2015 in Denver. We will again find a local restaurant for an evening dinner on the Wednesday evening followed by drinks and discussion at a convention Hotel Lobby. Please mark the date in your diary. Mary Kelley has volunteered to organize and make a tentative booking at a restaurant for the group in Denver. Details will follow. Please email my graduate student Sam Adamson (sadamson@anatomy.usyd.edu.au) if you would like to be added to the WISER email list. The ISER executive has approved the formation of a WISER steering committee which will be under the general umbrella of the ISER Mentoring Initiative. This group will be tasked with organizing WISER events and initiatives at future ISER Biennial Meetings, ISER off-year Glaucoma meetings and at ARVO each year. Our inaugural meeting in San Francisco created an opportunity for the junior and senior women of ISER to interact at a personal level and as a direct outcome of this event, a number of mentees have requested to be mentored by women whom they met on this occasion. Many of the senior attendees also enjoyed the evening tremendously and deepened friendships. It is only because ISER has smaller number of attendees than ARVO that we are able to offer attendees better opportunities to interact with leaders in the field. We are quietly confident that many friendships and support networks have developed and will be maintained as a result of this inaugural WISER event. WISER welcomes attendance to all its functions for male trainees/YIs/Senior Investigators who share our goals of a mentoring group where more senior investigators advise junior investigators on which activities they should focus on, and how they should present themselves and make connections. It is a pleasure to be writing a section for the ISER newsletter once again. Following my attendance at the 2012 Biennial Meeting in Berlin, I wrote a section detailing my experience, from the perspective of a young investigator. It is therefore appropriate that I now write an update to this, as I have recently returned from 2014 meeting in San Francisco. Firstly, I would like to express my admiration for ISERs continuing commitment to young researchers. This year, I was a recipient of a BrightFocus Travel fellowship, without which I could not have attended. I found it particularly impressive that I was just one of 33 young scientists present at the meeting due to receiving similar awards. As mentioned in my last section two years ago, all platform sessions I attended contained at least one young investigator, all of which presented some very interesting and exciting findings. The senior scientists also embraced the ISER philosophy, making plenty of time to view posters, discuss results and offer advice. I felt that the size of the meeting was perfect. The schedule, venue and attendance numbers were all substantial enough to enable a great breadth and depth of knowledge to be displayed, yet small enough to allow for more detailed, personal discussion. This occurred not only in the designated coffee breaks, but also during the platform presentations themselves. Personally, I found this relaxed approach refreshing, and highly conducive to understanding the presented work in relation to the wider field. Of course, apart from the science, I also very much enjoyed visiting the wonderful San Francisco. In my experience, the choice of host cities for ISER meetings has been brilliant and varied, and is another great strength, allowing for truly international participation. I will end this piece in a similar fashion to last time, by looking forward to my next two years in this exciting field. The 2014 Biennial Meeting has inspired me to re-double my efforts, and further progress my career. I would definitely consider attendance at the 22nd ISER meeting (my 3rd) in 2016 to be a considerable bonus associated with such progression. Dr. Paul Kay is a post-doctoral researcher in the Ocular Molecular Biology and Mechanisms of Disease led by Dr. Luminita Paraoan in the University of Liverpool. ISER members received an electronic ballot via email. Please remember to vote. Members can only vote once; duplicate entries will be disqualified. The election is open through October 22, 2014. ISER members can now post and view career opportunities on the ISER website. To request a career opportunity be posted on the ISER website, please email your request to the ISER Secretariat at mail@iser.org. Postings will remain live for 90 days, or until the position has been filled. Visit the ISER Career Center for complete details. Your ISER membership has been renewed for the year 2015. To maintain your membership, your membership dues can be paid online or by mailing your payment. A hard copy invoice is being mailed to your billing address at this time. Dues are considered delinquent after January 1, 2015. ISER accepts Visa, Mastercard and American Express. PLEASE NOTE the member name, membership number or another personal identifier on the check to ensure payment is posted correctly. New this year! You can renew your dues for two years at a discounted rate of $225 for regular members and $175 for young investigator members. To take advantage of this offer, you must check the appropriate box on your mailed invoice, or contact the ISER Secretariat. Two-year memberships cannot be paid online. Pictured are members of the laboratory of Ryan Thummel, PhD, an Assistant Professor at Wayne State University Medical School. 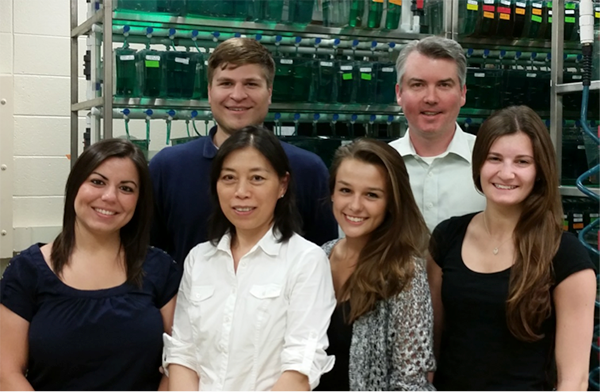 The Thummel lab uses the zebrafish as a model system to study retinal degeneration and regeneration. Zebrafish maintain the remarkable ability to regenerate their neural retina following injury. We are interested in the molecular signals that trigger and regulate this regenerative response. Lab members are pictured in our fish facility, which houses approximately 11,000 adult zebrafish. Front Row (left to right): Jennifer Thomas, a graduate student who just defended her PhD and is moving to the University of Washington in Seattle for a joint post-doc position in the labs of Dr. Rachel Wong and Dr. Tom Reh; Xixia Luo, a Research Assistant and lab manager; Lexie Ranski, a rising Junior and Honors Biology student at WSU, who is completing her Honors Thesis in the lab; Emma Gaboury, a rising Junior at the University of Notre Dame, who is sponsored by the Summer Undergraduate Research Experience here at WSU for work the lab this summer. Back Row (left to right): Greg Morgan, a recent BMS Master’s degree recipient from WSU SOM who will start his PhD this August; Ryan Thummel, PhD.